Aluminum garage doors are often thought of as belonging in the realm of commercial applications only. Well not anymore! The overhead garage doors with all the windows that you are used to seeing at the speedi-lube have made their way into residential architecture in a big way. They are being used on residential designs that fall into the category of post industrial contemporary styling and make a big impression if your garage is part of the street-scape. The photo at the left shows aluminum doors manufactured by Overhead Door from their Modern Aluminum Standard 511 Series. This series is non-insulated (the framework) but the glazing is available insulated and in low-e coatings. Since the glazing makes up the majority of the garage door surface, they are effectively an insulated door with high style. The glazing is available double-strength or tempered in frosted glass, mirrored glass, reed glass and tinted glass giving you an array of design options and choices to go along with the 197 powder coated colors that are available on the framework of the door. The frame rail assembly has integrated stiffening struts to give you a stronger, yet lighter garage doors with a sleek and sophisticated appearance. The Standard 511 Series comes in widths up to 16' and it's corrosion resistant aluminum frame rails will give you years of excellent service, pleasure and value. The Standard Series 511 Aluminum Doors come in a variety of vertical rail widths and horizontal stile widths to give you unlimited design flexibility to complement your home's unique style. You could use different widths for the vertical than you use on the horizontals to achieve that one-of-kind look. If you need a wider overhead garage door with this look, or a high-wind resistant garage door, the Heavy Duty Frame 521 Series is available in widths up to 26'. The frame rails are a bit wider but you can still achieve the same look as the garage door shown in the photo above. 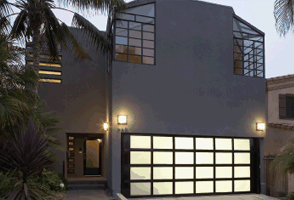 Aluminum garage doors are and excellent choice if your design requires a post-modern or super-contemporary treatment. You should consult your local Overhead Door® dealer near you for exact sizes, styles and pricing. If you have low-ceilings in your garage, they have special track systems that will accommodate your situation.